Uncanny X-Men Issue 10 Finally Acknowledged Storm Is a Real Goddess? 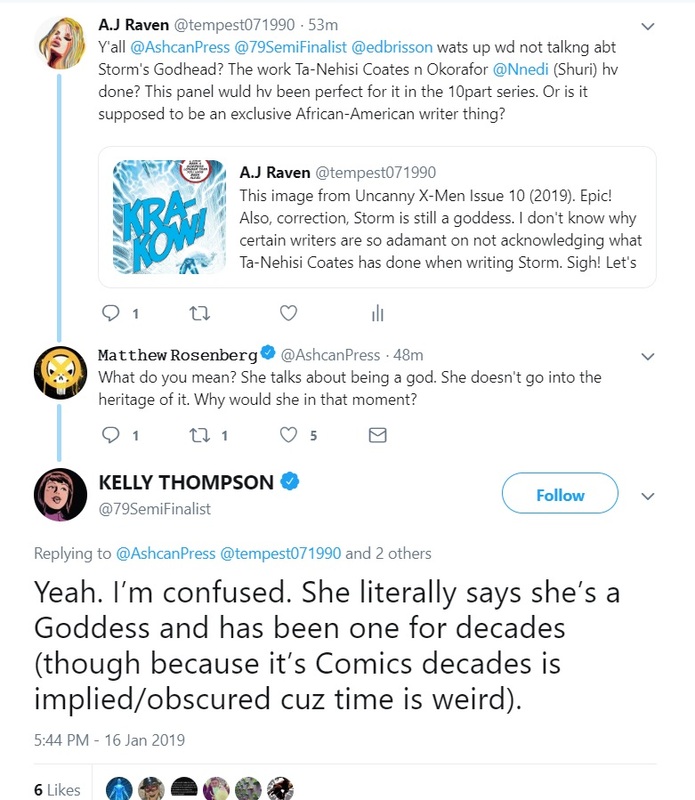 Uncanny X-Men Issue 10 released this week and while it brought a big change for mutants in the Marvel Comics, did a major X-Men book finally acknowledge the work Ta-Nehisi Coates has been doing regarding Storm being an actual Goddess? Spoilers for Uncanny X-Men Issue 10 follow. Hope you survive the experience! I have shared my thoughts about how it seems other Marvel writers have been ignoring Storm’s status as an actual Goddess. Ta-Nehisi Coates has done a wonderful job of fleshing out Ororo’s heritage. He shared that the weather-controlling mutant possessed the gift of Godhead. Marc Guggenheim also touched upon Ororo’s divinity in X-Men: Gold, but in a manner that seemed to contradict what Coates laid out. Furthermore, Tom Taylor didn’t mention anything in X-Men: Red. However, Okorafor did remember in her Shuri solo-series. So, basically, none of the main X-Men comic books, which understandably sell more than Black Panther and Shuri, talked about Storm being an actual Goddess. I thought this would change in Uncanny X-Men: Disassembled, a 10-part event comic book series which was ready to shake things up for mutants, but even nine issues in, I got nothing. Now, Uncanny X-Men Issue 10 has been released and there is a panel where an enraged Storm attacks X-Man. What do you think? 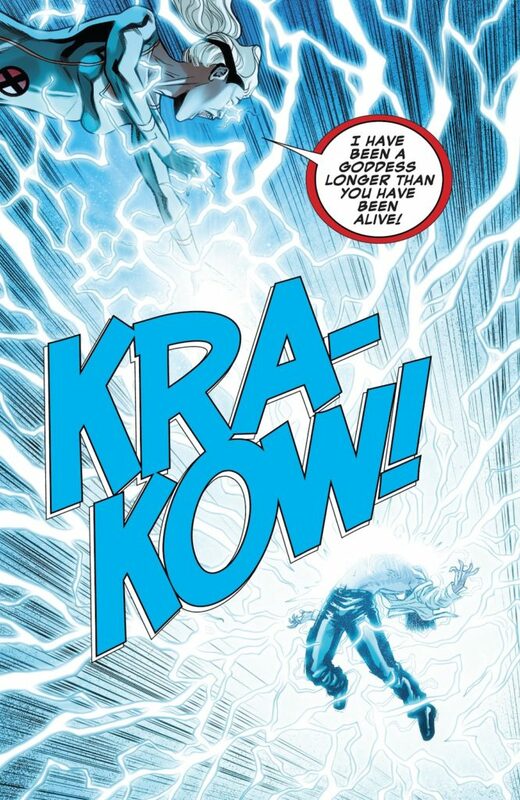 Is a single line enough to tell numerous readers about Ororo being an actual Goddess? Would it have helped if some other member of the X-Men said something about X-Man being in trouble because a true Goddess is angry at a mutant pretending to be a God? Will other writers handling upcoming major X-Men titles do more or are we to continue to rely on Coates and Okorafor to learn more about Ororo’s heritage? It seems like something worth exploring beyond a few passing comments. 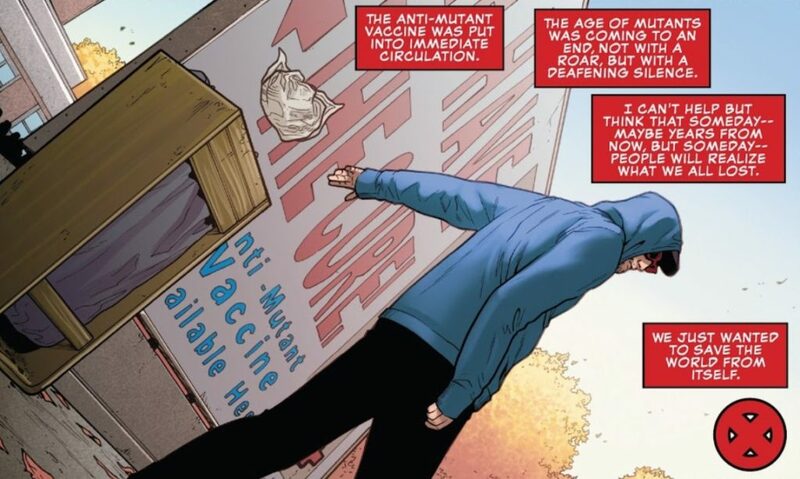 As for the rest of Uncanny X-Men Issue 10, the government has doubled down to eradicate mutants and the mutant gene. Such a move came across as drama for the sake of drama. Did the Avengers and other superheroes not try to stop such a move from the government? Is the Fantastic Four okay with such a decision considering Franklin Richards is a mutant, too? Where the heck is Wiccan with his reality-manipulating powers to stop all of this from happening? I hope we get an explanation soon because right now the entire story seems to have certain plot holes to hype Cyclops’ return. Just to be clear, I have nothing against writers Matthew Rosenberg, Kelly Thomspon, and Ed Brisson. I have been a longtime fan of their work. You should all read Thompson’s West Coast Avengers. It is so much fun! I’m just puzzled that Ororo’s heritage comes up so rarely. I greatly appreciate they replied to my tweet and I look forward to reading more of their stories. What did you think of Uncanny X-Men issue 10? Let us know. Next: #StompforQueen! Twentieth Century Fox Home Entertainment Announces “Bohemian Rhapsody” Fan Celebrations! Agreed. Not sure why the main X-men series don’t explore this either. Honesty, its long overdue. There was an issue called Rogue Storm back in the day and I would like to see that power she called upon explored more with an unlimited state. I think ppl have also been wanted Storm to actual finally be labeled as omega but honestly I would prefer her just as a title of Goddess with added elemental powers and the ability to convert herself in a sorceress at will. There a sort of regal protector about Storm. She is like mother nature herself and fights for the good of all people and the world. I would like to see her praise more because of who she is and for people to hold her to the highest regard. She is always the voice of reason and the mother to any younger X-men. She has so much character than other X-men ever. It high time creative minds to step in and see beyond to give the Character the story she needs.